The last stitch was taken and now Ripples is a finished quilt. I like the bright colors and how the pattern shows off the fun fabrics. 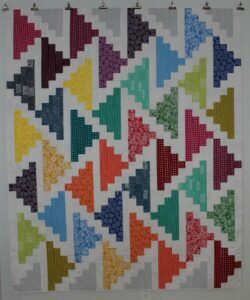 Ripples measures 65″ x 78″ and is my 17th completed quilt for the year – only 8 more to go to meet my goal.